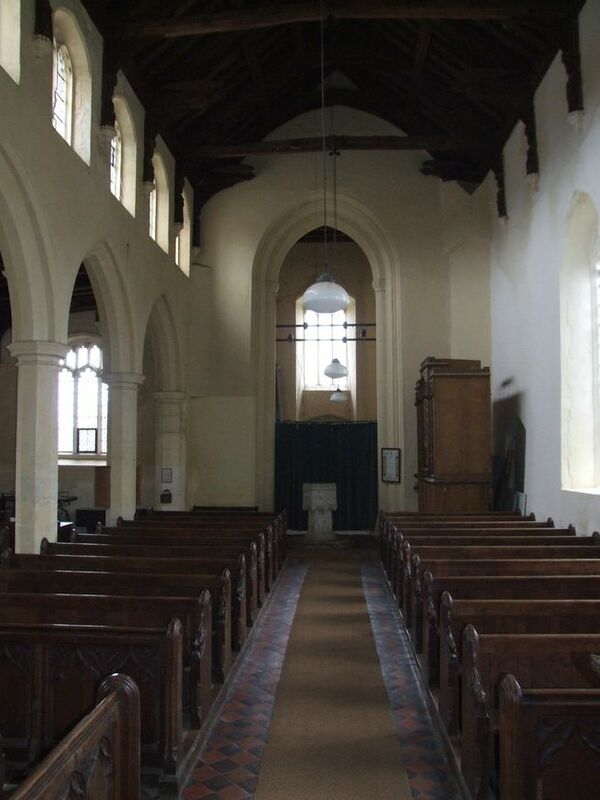 In this little-known Suffolk village stands a stunning jewel of a church. It is not grand, or particularly important. But it is beautiful. Here is 15th century splendour on a small scale, on a parochial scale. I remember first arriving here late one summer afternoon, and the flushwork of the porch shimmered in the low sunlight. Picked out on it in flint are Marian monograms, and, low down on a buttress, a blacksmith's anvil and tools. As I stood in the honeyed light of the graveyard, the smell from the adjacent fish and chip shop wafted across the graveyard, and a passing car radio played Elvis. My memory fused all these sensory images into a notion of an ordinary Englishness, a touchstone to ordinary people down the long Suffolk generations. I won't ever forget it. The tower is also decorated with Marian imagery, and a dedicatory inscription to the donors, John Fyncham and his 'wyf'. The clerestory is picked out in red bricks above the south aisle. At a lower level, the 15th century corbel heads all depict different people, obviously carved from the life in their cowls. Were they masons? Building workers? Ordinary citizens? 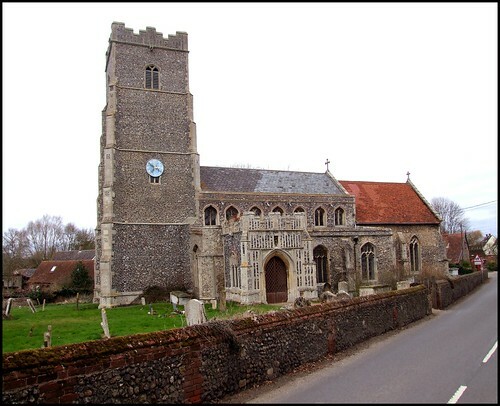 Few Suffolk churches present such an enchanting prospect. I came back in the heart of winter in early 2008, some nine years later. But nothing had changed, and the crisp winter sunlight glinted in highlights on the flint and stone. It felt good to be back here, and I stepped inside. 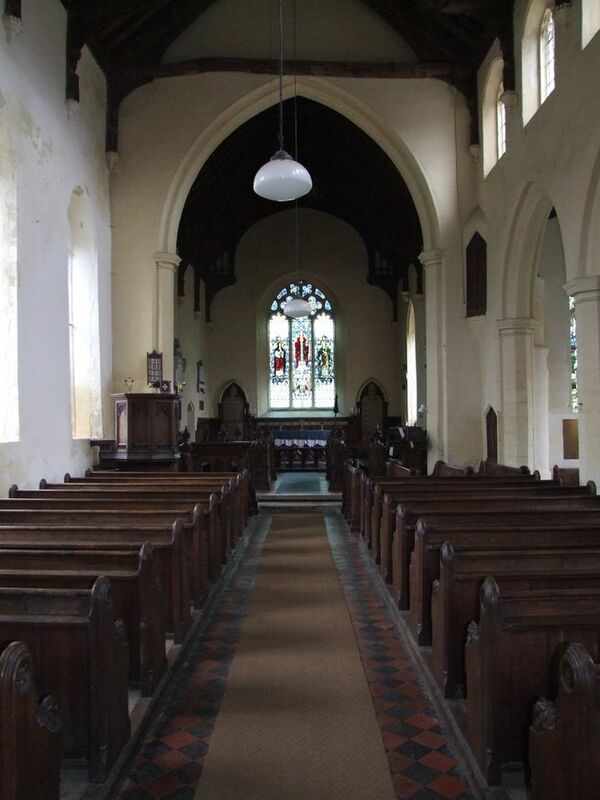 Inside, the nave is light, the arcades delicate and beautiful. The hammerbeam roof, contemporary with porch and tower, retains its medieval angels, albeit restored, and there are other figures on the wallposts. The roodloft stairs turn into the chancel arch, and a little quatrefoil window looks out from the stairway into the south aisle. Probably, it was purely decorative. The 19th century restoration was kind and sensible, and the tiles and furnishings it installed are good, retaining the rural ambience. The 20th century brought a austere, stunning east window depicting Christ in Majesty flanked by the Blessed Virgin and St John. It looks as if it is by the Powells. There are medieval survivals. Most striking is the ornate font, looking like a 14th century wedding cake. My favourite, however, is the panel of glass from a century later in the west window above it. It depicts a fork-bearded head, almost certainly the face of Christ in Majesty. Incidentally, the name of this village varies in historical documents. 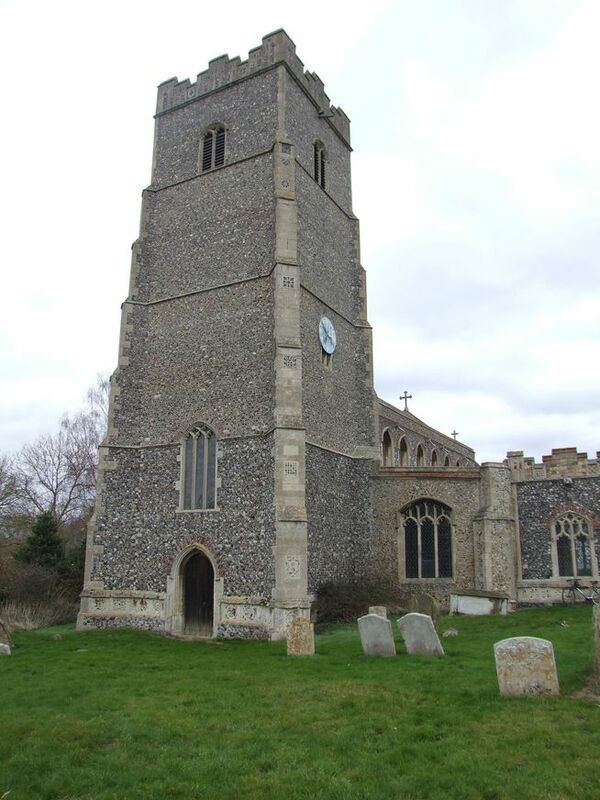 For much of its life it has been Ashfield Parva, the counterpart to Ashfield Magna, now Great Ashfield, a mile away. This confusion confused the medieval dedications of the two churches when they were rediscovered by the 18th century antiquarians. In medieval times, this church was dedicated to All Saints. But when the dedication was restored by an increasingly Oxford Movement-influenced Church of England in the late 19th century, they repeated the 18th century mistake. 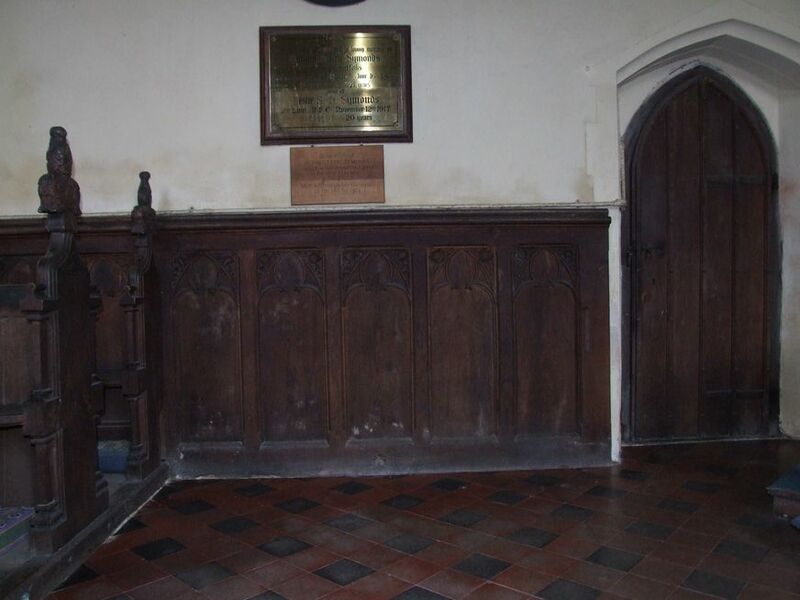 So, this church at Badwell Ash is now known by Great Ashfield's medieval dedication, St Mary. Great Ashfield, you'll not be surprised to learn, is now called All Saints. Here, then, on a small scale, we have a solid testament to the aesthetics of English Catholicism as it was on the eve of the Protestant Reformation. 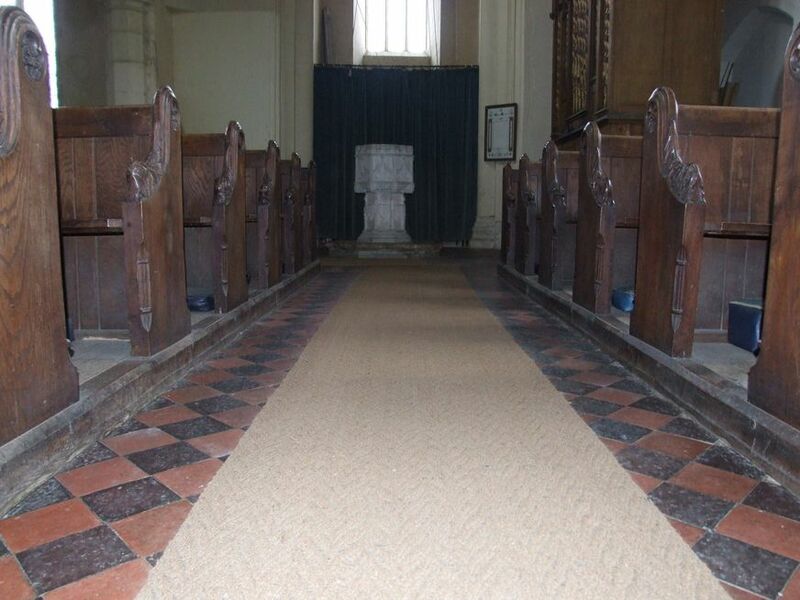 That this parish has cared for it so well since is a tribute to them.